Lighting a home with downlights is an easy lighting solution, but providing multiple ranges of downlights custom-designed for installation in New Zealand’s unique thermally-insulated ceiling spaces takes a lot of skill and experience. Halcyon Lighting has led the way with downlight and driver innovations designed to deliver quality light from fittings that operate safely over a long service life. While downlights are only part of the extensive Halcyon portfolio, the many LED options now available in residential, commercial and industrial ranges attest to the design innovation driven by director Royce Everett. His understanding of the unique features required for the Kiwi lighting environment and his ability to create new fittings or adapt international fittings to meet these needs has enabled him to develop lighting fixtures that are more effective in New Zealand applications. Several years ago an informal attempt within MBIE to prevent arc flashes occurring rippled through the power industry and the consequence today can be seen in a regulatory push to all but cease live work. What began as an attempt within the Department of Labour to address the safety of HV live line work via a rewrite of ECP 46 was not taken up formally by the Department and, when DOL was folded into MBIE and the newly-formed Worksafe, the informal code of practice review continued but was not taken up by this new workplace safety regulator. However, in its short life it did enough to raise concerns about live work. The replacement of the HSE Act with the new Health and Safety at Work Act (HSWA) in 2015 provided added impetus to these concerns and Worksafe, and now its Energy Safety operation, are both opposed to live work. This puts the regulators at odds with the electricity supply industry (ESI) that has long practised working with lines and systems energised and in compliance with the law. The industry has been so safe with the practices it has developed to carry out live work, that on the few occasions where a serious accident or fatality occurs, it invariably makes the news. If you are part of a team tasked with designing or redesigning a machine to make it more precise and work more effectively, a productive place to start is looking at the greater levels of motor control and design flexibility offered by the new machinery drives from ABB. The latest ACS380 and ACS880 variable speed drives now incorporate such a high level of smart functions, you can reduce the cost of motor control while significantly improving application productivity and the reliability of the machine itself. 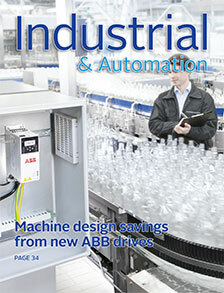 ABB’s drive business manager, John Keir says the new ACS380 and the high-end ACS880 now have more automation functionality built into the drives as standard so that, for many applications, the customary use of additional PLCs, HMIs, relays and external power supplies is no longer necessary. Large arena sports lighting came of age three years ago when the NFL Super Bowl was for the first time lit by LED. Gridiron fans around the world were able to watch the US national football championship final in vivid detail thanks to the brightness and clarity offered by the Ephesus Stadium Pro luminaires that lit the field of play. 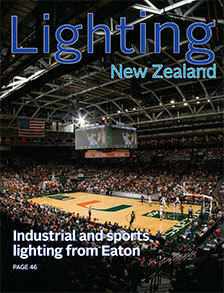 Sports arenas in New Zealand now have ready access to the range of Eaton’s award-winning Ephesus luminaires and can confidently upgrade their old HID lighting with high-performing LED and no additional costs such as having to specify more luminaires or erect new towers, says Cuthbert Stewart (CSL) chief executive Phillip Elliott. CSL is introducing Ephesus to New Zealand as America’s leading brand in LED lighting for stadiums and other high-lumen outdoor and industrial applications. 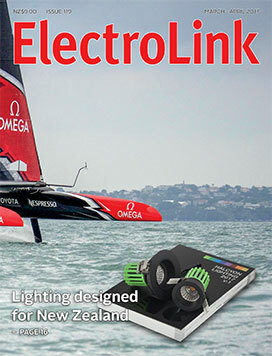 “This is just another addition to the broad range of high quality products that Eaton’s Crouse-Hinds supplies to CSL for the New Zealand market,” says Elliott. ED light sources have improved the efficacy of downlights, but are there further improvements to be made? Last year the US Department of Energy (DOE) reported that improvements in the luminaire performance of downlights measured by lumens per watt are tapering off, even though other luminaire types are still seeing an annual improvement of around 10 lm/W. This is mostly because the easy efficacy gains have already been made so downlight manufacturers are focusing on reducing costs and improving quality. As the lighting market continues down its unrelenting path to the complete adoption of LED, it is clear that the regulating of the energy efficiency of lamps and luminaires by agencies of the State is becoming as redundant as the legacy lighting technologies LED is replacing. When companies like Cree are now offering LED replacements for 100 watt incandescent lightbulbs that deliver 1650 lumens with efficacies exceeding 100 lumens per watt, the marketplace is achieving efficiency gains that state-control ideologues could have only dreamed about a few years ago. Despite this, energy efficiency regulators in Australia and New Zealand are increasing their efforts to bring the distribution and supply of LED lighting products under their control through the introduction of mandatory minimum energy performance standards (MEPS) for LED lamp technology and non-integrated commercial luminaires.